“Do it” or do “it”? What is a "do it" or should that be a 'do "it"'? There have been advertisements on the TV for it, there have been piano players on the TV and there was the famous “Censored” billboard but the one I wondered about the most was this billboard advertisement. Now, I know (or at least I think I know) what “it” is in the context of ‘”it”‘ and I can then surmise what ‘do “it”‘ means in that context. What I can’t work out is what a ‘”do it”‘ actually is – I remember years ago we passed around messages about a “tuit” – especially the one that had the round shape, but I have never run across a “do it” before. 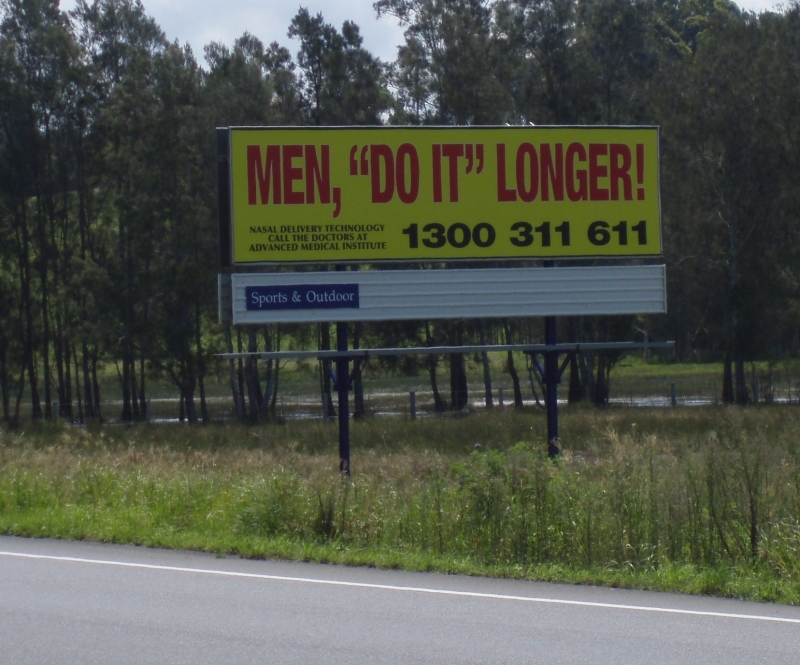 I reckon the advertising agency screwed up and intended to have a billboard message of ‘Men, do “it” longer’ but had trouble working the English out so ended up with having longer “do its” instead! I believe the “do its” are very expensive as well – but that is another story.